Just add something new is the requirement to this challenge over at Just Add Ink. So, that wasn’t difficult right? I just stumbled upon this blog the other day and was anxious to play along for the first time! The first new item on my card is the embossing folder I have on the pink cardstock, it’s called Juli’s Garden and is made by Provo Craft. It’s so much fun breaking in a new toy for the first time! Wouldn’t you agree? The other challenge this card is for is over at Stamp TV and they are using a Tic Tac Toe board and you have to make your selections based on the game we all played as kids. My choice was Rhinestones, Ribbons, and Pearls. I think you can find the black rhinestones, and the ribbon, however seeing the pearls might be difficult. They are coming out of my flowers in the corner. I bought them at Michael’s in the wedding isle and thought they might be fun to add to a card some day! So they are my second ” new” item that I have never used before!! 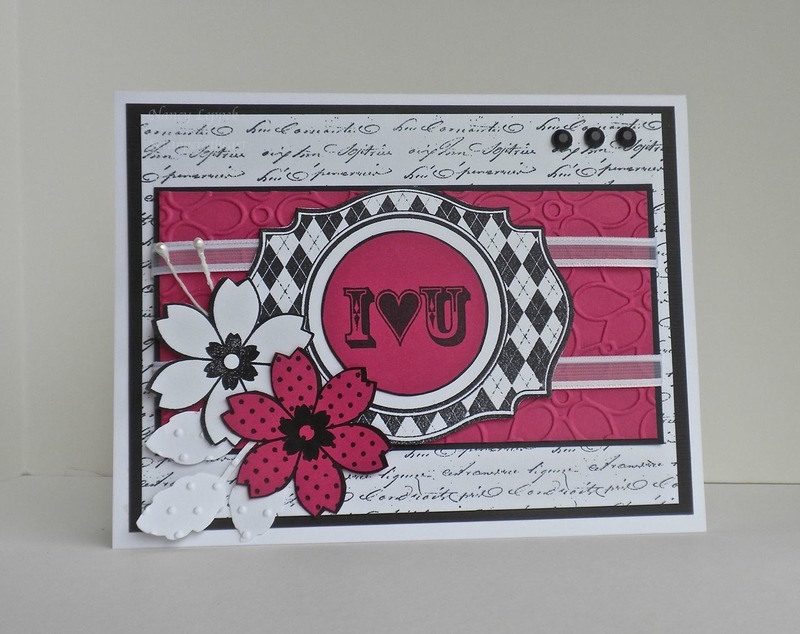 The Diamond background stamp and the i love u sentiment is from Gina K over at Stamp TV. The background stamp script is from Stampibilities and I bought it at a Stamp Expo. The flower stamp is from Verve and the leaves were made with my cuttlebug and embossed. Add some ribbon and some accessories and there you have it! I so appreciate you stopping by and making comments, it just makes me realize what I am doing here does matter and that’s what I need to be reminded of some days! Thanks so much! Categories: Uncategorized | Tags: Card making, Cards, Gkd, love, rubber stamps, Stamp TV, Verve Stamps | Permalink. oooh! I love the new blog layout!!! Beautiful!!! and this card is awesome!! Ooh-La-LA!! Nancy, it’s great to have you play along with us at Just Add Ink! I love the way you’ve used your new “toys” – this is a really beautiful card. Love all the texture you’ve created in this card!